After battling a mutant camera for a full year, I finally bought a new one in July. A Casio Elixim Z-100. I was so excited about it. Tiny...perfect for throwing in my purse. Camera troubles no more. That is until it broke. The zoom no longer functions. So today I sent it in to Casio. Perfect timing for the holidays. I will be crushed if it is not here by Christmas. Today I had a cherished mothering moment. In Ellery's classroom as I sat cross-legged during "rug time" guess who came and snuggled right into my lap? My little Ellery. The moments are ticking away until I inevitably become "untouchable." I just love every minute with my children. She giggled and looked up at me with sparkly eyes as we listened and praised all the "Tom Turkeys" disguised cleverly to hide from the farmer on Thanksgiving. 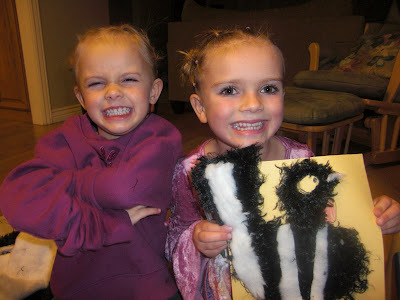 Ellery's tricky turkey turned into a stinky skunk! That is what I would call it. It happened after my sweet Emmett was born. It has consisted of cherishing and relishing each moment, and suddenly not wanting them any bigger.